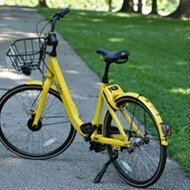 Nearly a month after bikeshare company Ofo decided to pull up stakes in all of its U.S. locations not named Seattle, San Diego and New York City, the distinctive yellow bikes can still be seen on St. Louis streets. But determining how many Ofos remain in St. Louis leads to a troubling conclusion: Hundreds have simply disappeared. 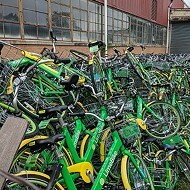 Although Ofo has donated around 250 bikes to St. Louis BWorks — which runs free programs that lets kids earn their own bikes while learning bicycle safety and repair — that number appears to be dwarfed by those destroyed in scrapyards or hoarded by savvy users who have managed to detach the electronic locking mechanism. "I've seen plenty of them around where the locks have been removed," says BWorks executive director Patrick Van Der Tuin. "Unfortunately, I think a lot of them have probably gotten scrapped out and recycled by different individuals." 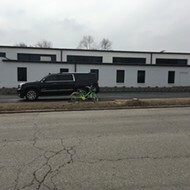 Ofo, a Chinese company, launched its St. Louis fleet of 750 bikes in early May, setting itself up as a slightly cheaper alternative to competitor Lime, which had let loose its own distinctively-colored bikes just one month earlier. 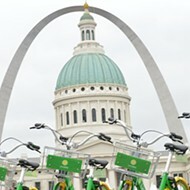 As their popularity spread, both company's bikes became ubiquitous sights on St. Louis roadways. But Ofo's St. Louis presence lasted just two months. In July, the company announced that it was severely restricting its U.S footprint to only include only those "markets that will best enable us to grow and build the business." St. Louis was not one of those markets. According to Bworks' Van Der Tuin, workers from both Ofo and Bworks collaborated to collect the remaining bikes on the streets and bring them to a warehouse. It was during this process, says Van Der Tuin, that Bworks workers discovered a whiteboard the Ofo team had used to track the numbers on the recovery effort. Van Der Tuin shared a photo of the whiteboard with RFT. In the top right corner, blocked off by black marker, someone had written, "Total shipped to STL 1510." Below that, in blue marker: "Missing: 702." Beside that figure, in red marker, "Scrapped: 495." The numbers present a startling arithmetic: If accurate, they indicate that after just two months, approximately half of Ofo's 1,500-strong St. Louis bike fleet had disappeared. Another 30 percent were apparently scrapped. 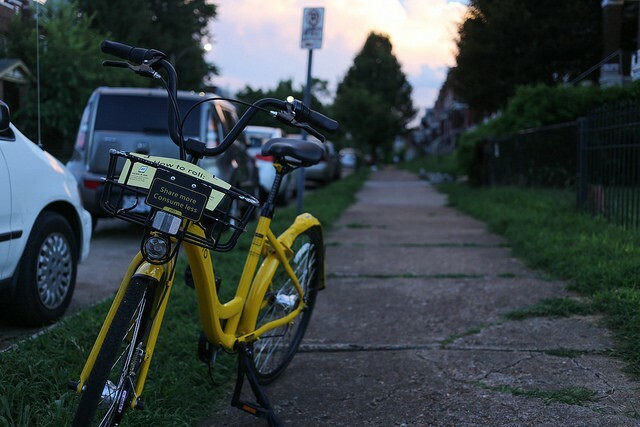 An Ofo representative repeatedly declined to respond to specific questions about the company's efforts to reclaim its existing bikes in St. Louis. On Wednesday, spokesman Taylor Bennett wrote that he did not have exact numbers to share about Ofo's operations. 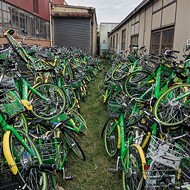 Instead, Bennett provided a general statement that emphasized the company's commitment "to environmental sustainability," explaining that the company, "will continue to donate Ofo bikes in good working condition to local organizations and recycle all bikes when they're beyond repair or no longer able to use." Bennett added, "And since we're still serving other markets across the U.S., we are also repurposing assets for those cities." 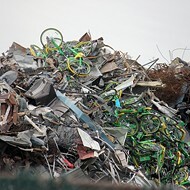 The statement is identical to the one issued earlier this week to the Dallas Morning News, which reported on a startling photo showing hundreds of Ofo bikes piled in yellow mountains within a South Dallas recycling facility. However, there is disagreement over the true number of Ofos in St. Louis. According to the city's records, Ofo shipped only 750 bikes, not 1,500. That doesn't match the records Bworks recovered from the Ofo team in St. Louis. And it's worth noting that St. Louis' contract allowed Ofo to bring an initial shipment of 750 bikes, then add "up to 350 each month." Simple math of that initial number plus two months of service adds up to, yes, 1,500 — the number noted on the whiteboard. Yet Koran Addo, a spokesman for Mayor Lyda Krewson, says Ofo only had 750 bikes here, total. "That is the cumulative total they had in operation while they were in St. Louis," he says. If that's the case, the whiteboard is simply wrong. As for Bworks, the donation of around 250 bikes has created both opportunity and headaches for the organization. Workers are now attempting repair the bikes into usable condition, but Van Der Tuin says that the Ofos aren't well-suited to Bworks' programs, which are targeted at kids and teens. "These are generally bigger bikes, for adults, and they wouldn't fit the bulk of our students," he says. "Ofos are also not necessarily the style or look of bike that these kids want to earn by going through the program." While Bworks repairs the bikes, Van Der Tuin says he's searching for organizations to take them, including local universities and homeless shelters. 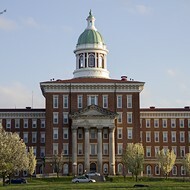 That effort could be quickened, he says, if St. Louis chipped in to help fund the repairs. He notes that the city's permitting contract requires bikeshare companies pay an annual $500 license fee, plus a $10-per-unit fee that's supposed to be reserved for bikeshare-related infrastructure changes, including "converting parking spaces to dedicated bike share parking, moving street furniture, and putting up signage." According to Addo, the city collected $27,958.34 from from Bird, Lime and Ofo between April 16 and July 27, and the money has been deposited in the general revenue fund. In an email, Addo explained that infrastructure changes are still pending. 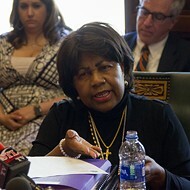 "With the program being so new, we have not implemented any changes to the system, as we are still collecting data," he wrote.